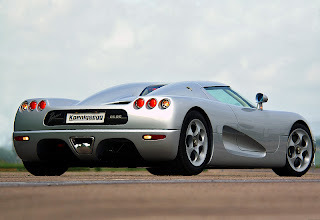 The Koenigsegg CC8S is a mid-engine sports car, the first produced by Swedish automaker Koenigsegg and the first production car to use dihedral actuation doors, a feature that has become a trademark of the brand. At its introduction it won several awards, including the Guinness World Record for the Most Powerful Production Engine and design awards from both Red Dot in Germany and Utmärkt Svensk Form in Sweden. The CC8S was developed from the CC prototype. Despite limited resources, the chassis, suspension, brakes, and several other components were custom-designed by Koenigsegg. 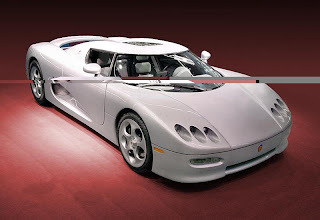 Although the car's design was unique and received great amounts of attention, Koenigsegg decided to bring the CC prototype to the Cannes Film Festival in 1997 to further promote the car. The public's reaction to the car was favorable and international contacts were made. Koenigsegg's confidence was elevated by this and the decision was made to prepare the CC8S for production. Five years later the CC8S model entered production, but only 6 cars were produced before it was replaced by the more powerful CCR model. The body is a two-door, two-seat Targa top design, meaning a portion of the roof may be removed and stored under the bonnet. The chassis is made from kevlar-reinforced carbon fiber. The kevlar-reinforced carbon fiber semi-monocoque is attached to a steel subframe at the front of the chassis, and an aluminum subframe at the rear. The engine, transmission, and rear suspension is mounted to the aluminum subframe. All body panels are made from carbon fiber, and venturi tunnels and diffusers occupy the bottom of the car. These venturi tunnels and diffusers increase downforce in conjunction with a rear-mounted spoiler. The frontal area of the car is just 1.825 m² which accounts for the CC8S to have a low Cd of just 0.30. The CC8S is powered by a Supercharged Ford Modular 4.7 L DOHC V8 made of cast aluminium with 4 valves per cylinder and carbon fiber covers weighing 210 kg (460 lb), with a compression ratio of 8.6:1. It produces 655 PS (482 kW; 646 hp) at 6500 rpm and 750 Nm (550 lbft) at 5000 rpm. The redline is set to 7300rpm. The engine powers the rear wheels through a 6 Speed CIMA developed manual gearbox. The CC8S uses magnesium alloy wheels with center-locking hubs, which 225/40ZR 18" front and 335/40ZR 20" rear Michelin Pilot Sport 2 tires are mounted. The discs are cross-drilled for increased ventilation, and measure 340 mm (13 in) at the front and 315 mm (12.4 in) at the rear. The brake calipers contain 6 pistons in front and 4 pistons at the rear. The brakes are power-assisted by the Koenigsegg Advanced Control System. Last updated on 10 July 2013 at 12:39. Students who wanna be a CIMA professional but stay busy with other works and can't attend coaching can try CIMA online study for cima exam preparation.Now online have more than 500 questions for lots of practice which have real CIMA exams standard. So you can not even study at night after completing your work.